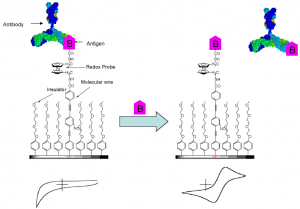 The Biosensor is used to detect the analyte so the Biosensor is an analytical device and it gathers the biological components with a Physicochemical detector. The sensing biological elements are biometric components interact with the recognize and analyze the study and the components like tissue, microorganisms, antibodies, nucleic acids and etc. The sensitive elements of biological can also generate by the biological engineering. The detector elements transform the signals from the interface of analyte with the biochemical elements into other signals like transducer and it can be measured more easily and qualified. The Biosensor devices are associated with the electronics and the signal processors and they are generally responsible for the display of the results and they are user-friendly. The Biosensor research has a significant role in the development of modern electronics. This article discusses about different types of Biosensors working and applications. A Biosensor is an analytical device. The sensor which integrates the biological elements with the Physiochemical transducer to produce an electronic signal is proportional to a single analyte and which is fetched into a detector. The preferred biological material like enzyme is preferred for conventional methods like physical or membrane entrapment and non covalent or covalent binding. The preferred biological material is in contact with the transducer. To produce a bound analyte through the analyte binds to the biological material which produces the electrical response to be measured. In some cases the analyte changed to a product and have some probability to associate with the release of heat, gases like oxygen, electrons or hydrogen ions. There are different types of Biosensors based on the sensor devices and the biological materials and some of them are discussed below. Electrochemical Biosensors is a simple device. It measures the measurement of electronic current, ionic or by conductance changes carried by bio-electrodes. The Biosensors are based on the electrons movement, i.e. 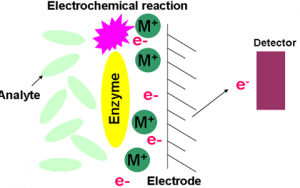 electronic current determination as a reaction of enzyme-catalyzed redox reaction. Generally a normal contact voltage passes through the electrodes to analyze. In the enzymatic reaction which produces the substrate or product can transfer the electrons with the surface of electrodes to be reduced. As a result an alternate current flow can be measured. The substrate concentration is directly proportional to the magnitude of the current. 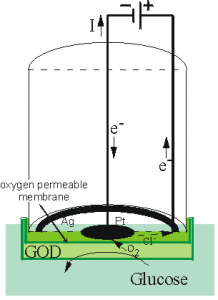 The reduction of oxygen is acquired through the oxygen electrodes and it is a simple way to from an Amperometric biosensor. The example is the determination of glucose by glucose. The above description is about the first generation of Amperometric biosensor and it has a direct transfer of electrons which are released from the electrodes are having some difficulties. The second generation Amperometric biosensors are developed in a mediator takes the electrons and transfer to the electrodes. 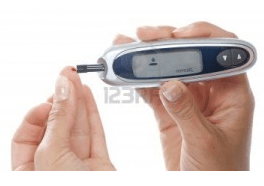 The blood glucose Biosensors are used widely throughout the world for diabetic patients. It has a single use disposable electrodes with glucose oxide and derivatives of a mediator (Ferrocence) and the shape of the blood glucose Biosensor looks like a watch pen. With the help of hydrophilic mesh electrodes are converted. The Blood glucose Biosensor is a good example of Amperometric Biosensor. In this type of Biosensors changes the concentration of ionic is determined by the ion-selective electrodes in this pH electrodes are used most commonly. Hence a large amount of enzymatic reactions is involved in the release of hydrogen ions. Ammonia-selective and Corbondioxide selective electrodes are some other important electrodes. The ion- selective field effect transistors are lower price devices. It can be used in the miniaturization of Potentiometric Biosensors. The example of the ISFET Biosensor is to monitor intra-myocardial for open heart surgery. In the biological system there are several reactions that change the ionic species. The electronic conductivity can be measured with the help of an ionic species. The example of the conduct0metric Biosensor is the urea Biosensor which utilizing the immobilized areas. The following reactions show the urea catalyses. The given reaction is associated with the drastic alteration in ionic concentration and they are used for the monitoring urea concentration. In generally during the dialysis and renal surgery the urea Biosensor is very useful. There are many more biological reactions are connected with the production of heat and it forms the basis of thermometric Biosensors. The diagram shows the representation of a thermal Biosensor. The diagram consists of a heat insulated box fixed with heat exchange. The optical Biosensor is a device, it utilizes the principle of optical measurements like fluorescence, absorbance and etc. They used in fiber optics and Optolelectronic transducers. The optical Biosensors are safe for non electrical remote sensing of materials. 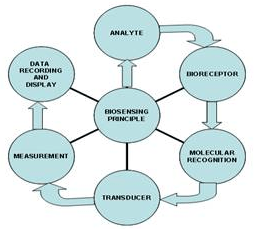 In the transducer elements primarily optical Biosensors involves in the enzymes and antibodies. Usually the Biosensors is not required any reference sensors and the comparative signals are generated by using the sampling sensor. The important Biosensors is described briefly. The working of the fiber optic lactate Biosensor is based on the measurement of change in oxygen concentration, molecular by identifying the effects of oxygen in fluorescent dye. The following reaction is reduced by the enzyme lactate mono-oxygenase. For the diabetes patients the blood glucose is more important to monitor. In this simple technique is used, i.e. Paper strips saturated with the reagents it contains glucose oxide, Horseradish Peroxidase and a Chrmogen. The following reactions take place. Using the portable reflectance meter it can measure the intensity of the colour of the dye. In the world wide the glucose strip industry is very high. The calorimetric test strips of cellulose covered with the suitable enzymes and reagents are in use for the view of more blood and the urine parameters. The other optical fiber Biosensors are used in the devices of optical Biosensing it measures the p CO2 and in critical care and in surgical monitoring. 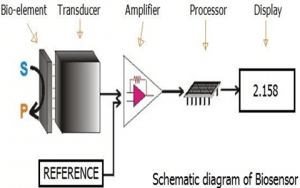 The principle of piezoelectric Biosensor is used in sound vibrations, hence it is called acoustic Biosensors. 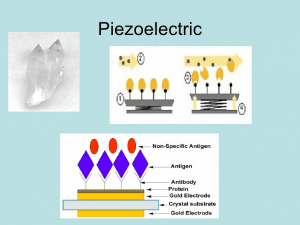 The basics of the Biosensors are formed by the piezoelectric crystals and the characteristic frequencies are trembling with the crystals of positive and negative charge. By using the electronic devices we can measure the certain molecules on the crystal surface and alters the response frequencies using these crystals we can attaché the inhibitors. The Biosensors for cocaine in the gas phase has been developed by attaching the antibodies cocaine to the surface of the crystal. The immobilized antigen can combine with the antibody which can twist to a second free antigen. The immobilized antibody combined with the free antigens and enzyme labeled antigen in opposition. This article is about the types of Biosensors, how does it works and Applications. I hope the given information in the article is helpful to give some good information and understanding the project. Furthermore, if you have any queries regarding this article and on electrical and electronic projects you can comment in the below section. Here is the question for you, what are the typical uses of Biosensor?